I can't decide if Warm Bodies is a zombie movie with romance and comedy or if it's a romantic comedy with zombies. Either way, I enjoyed it. 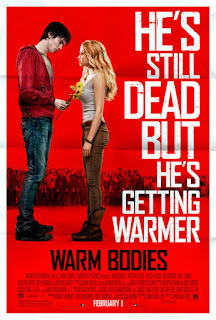 Warm Bodies is something I haven't been familiar with before: a zombie movie from the zombie's point of view. R (played by Nicholas Hoult) is a recently undead who wanders around the ruined shell of an airport. The shambling corpses are split into two varieties: the "regular" zombies who continue to shuffle along in mimicry of the patterns of their former lives. And then there are "bonies": those zombies whose decomposition has brought them too far gone to be helped. And all the while we're getting a running commentary of monologue from R courtesy of voice-over. Sorta like the flip-side of the Zombieland coin. R's "life" is in the shadow of an armed enclave of normal humans (led and controlled with an iron hand by John Malkovich) which sends scouting parties out on a regular basis to find food, medicine and ammo. Unfortunately one one such mission a party is attacked and R encounters Julie (Teresa Palmer), the bossman's daughter. What ensues is like a classic age-old tale of star-crossed lovers. Except she's young and smart and beautiful and he's... dead. I know. It sounds like twelve degrees of total hokey. And to be honest I wasn't too crazy about Warm Bodies when I heard about its premise. But having seen it, I cannot but confess that it was a cute little movie and quite worth spending an afternoon watching (especially with a girlfriend). 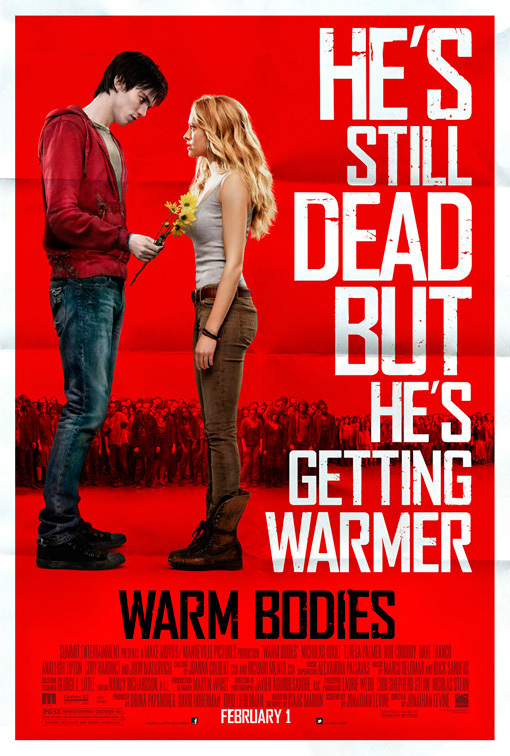 In a genre that has become stretched thin and tired and oh so terribly anemic, Warm Bodies is a refreshing breeze that succeeds admirably. And the zombie genre could learn something from it, too!